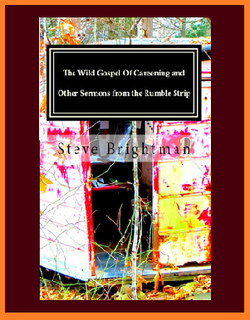 The Wild Gospel Of Careening And Other Sermons From The Rumble Strip is a collection of poems that attempt to straddle the chasm between faith and despair. They rarely succeed at that and find themselves futilely clinging to the rock embedded in either side. Steve Brightman lives in Kent, Ohio. He is a firm believer in two seasons: winter and baseball. He has been published online and in print and was included in the Ohio Bicentennial Anthology, I Have My Own Song for It: Modern Poems of Ohio. He wrote four chapbooks in 2013: Like Michelangelo Sorta Said (Poet’s Haven Press), Absent The (Writing Knights Press), In Brilliant Explosions Alone (NightBallet Press); and 13 Ways Of Looking At Lou Reed (Crisis Chronicles Press). He is working on a full-length manuscript and wants you to know that he wrote this chapbook for you.